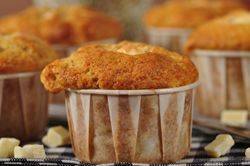 Here is a delicious Banana Muffin that is moist and sweet with a lovely golden brown crust. While this recipe is similar to the other Banana Muffin recipes on the site, it does differ in that it contains brown sugar and has chunks of white chocolate floating in the batter. If you do not have white chocolate chips, substitute with dark or even milk chocolate chips. Delicious warm from the oven, but they can be covered and stored at room temperature for a few days or even frozen. Banana Muffins use ripened bananas. Ripened bananas are bananas which have turned from bright yellow with no brown spots, to bananas which are mostly brown with yellow spots. Brown bananas are great for baking as they are soft enough to mash and make baked goods moist. When making these muffins you can line the muffin cups with paper liners which helps to keep the muffins moist and makes for easy clean up. Oftentimes, though, I do not use paper liners, which keeps the crusts of the muffins wonderfully crisp. Of course, the crust will soften after you cover and store the muffins but immediately after baking the crust will be crisp while the interior is soft and moist. White Chocolate cannot officially be called "chocolate" because it does not contain chocolate liquor. However, good white chocolate does contain cocoa butter, sugar, milk solids, vanilla, and lecithin. For this recipe you can use either white chocolate chips (chunks) or you can cut up a white chocolate bar. Either way, when buying white chocolate try to find a brand that contains cocoa butter as some inferior brands contain vegetable fat which does not have that wonderful rich and creamy flavor. Banana Muffins: Preheat oven to 350 degrees F (180 degrees C) and place the oven rack in the middle of the oven. Either line 12 muffin cups with paper liners, or you can butter or spray them with a non stick vegetable spray. In a medium-sized bowl combine the mashed bananas, melted butter, eggs, and vanilla. With a rubber spatula or wooden spoon, lightly fold the wet ingredients (banana mixture) into the dry ingredients just until combined and the batter is thick and chunky. (The important thing is not to over mix the batter. Over mixing the batter will yield tough, rubbery muffins.) Spoon the batter into the prepared muffin tins. Bake about 20 - 25 minutes or until a toothpick inserted in the center comes out clean. Place on a wire rack to cool for five minutes and then remove muffins from pan. Serve warm or at room temperature.